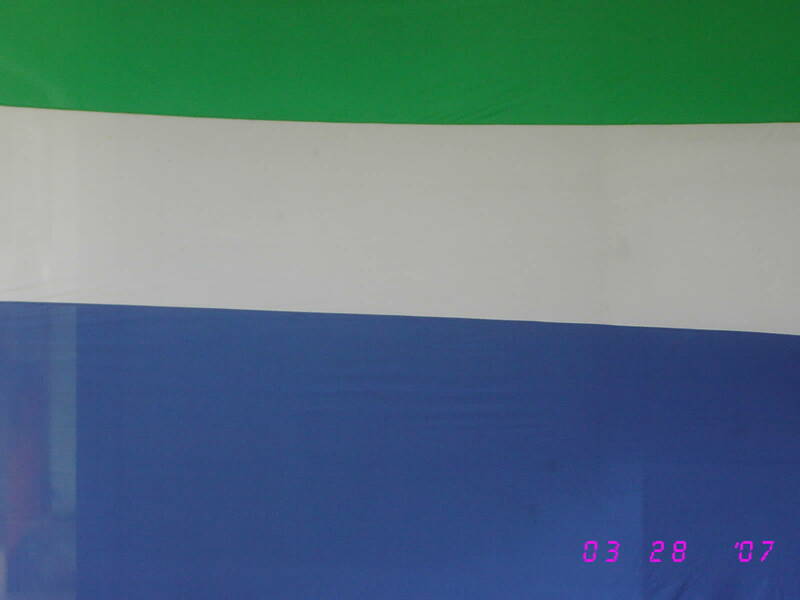 Juradó flag is described in the municipal web site as horizontal green-white-blue tricolor with inner ratio of 2:1:1, probably following the departmental flag. However, the photo at the web site show same arrangement of colors but in 1:1:2 inner ratio. Information in Spanish as follows: "Verde: Ocupa la mitad de la bandera y representa los bosques del municipio. Blanco: representa la paz y ocupa un cuarto de la bandera. Azul: representa el mar y los rios y ocupa el otro cuarto de la bandera." "Green covers half of the flag and represents the municipality woods. White represents peace and covers one fourth of the flag. Blue represents the sea and rivers and covers the last fourth of the flag." Timber of mahogany ("abarco", Swietenia spp., Colombian mahogany ("abarco", Cariniana pyriformis) and cedar is exploited in the municipality, hopefully in a responsible manner, since Juradó keeps the last mahogany forest in Columbia. The sea is here the Pacific Ocean.